FiltersFast 4-inch Air Filters (FFM136) have a MERV 13 rating and are useful in a variety of settings, including homes, offices, and industrial sites. The MERV (Minimum Efficiency Reporting value) rating explains the efficiency of your filter (a higher MERV rating means a more efficient filter). 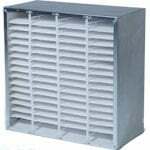 Standard fiberglass spun filters that you find locally oftentimes have MERV ratings of 1 or 2 and can lead to lower quality air flow at a higher cost. Not only will an air filter with a higher MERV rating increase the efficiency of your heating and cooling system, but you'll enjoy its benefits for a long time. 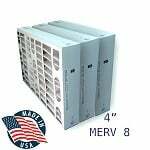 These MERV 13 filters effectively reduce pollen, dust, pet dander, mold spores, and dust mites, as well as bacteria, smoke, smog, and other allergens. The higher quality construction from these 4 inch filters benefits health and respiration, including alleviating problems with allergies and sinus irritation that might lead to itchy throat, watery eyes, coughing, and sneezing. 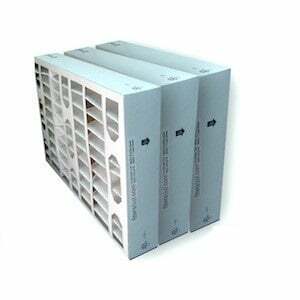 4 inch air filters are also more effective than thinner filters because their larger surface areas more much durable. FiltersFast air filters are affordable without sacrificing quality. 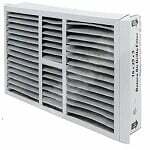 These HVAC air filters arrive in a variety of sizes to meet your air quality needs and are quite economical. Not to mention they are a cost effective upgrade from simple poly pleated or fiberglass filters. Prices listed are for a 3-pack of filters. For most homes, this is a year's supply -- and at a GREAT value! The chart below will show you what you can remove with a MERV 8 and MERV 11 air filter.